A young dymamic team of professionals at your service . We offer a quick, comprehensive and effective service throughout the Southern Suburbs for all your property needs. The Constantiaberg forms part of the mountainous spine of the Cape Peninsula in Table Mountain National Park, Cape Town, South Africa. The Southern Suburbs of Cape Town stretching from Newlands through all the areas along the base of the mountain towards Muizenberg are also loosely reffered to as Constantiaberg. Driving South from Table Mountain (927 m high), on the southern side of Constantia Nek, this scenic area is a much sought after residential paradise. Characterised by some of the best schools in South africa, the area is a high value property investment to all who live there. Constantiaberg, Devil's Peak and Table Mountain are the highest mountains in the range that stretches from Table Mountain all the way to Cape Point. The range, made up of resistant sandstones of the Table Mountain Group, dominates the southern suburbs of the city on the verge of the Cape Flats. The lower eastern slopes of Constantiaberg are covered by the commercial pine and gum plantations of Tokai forest, and are crisscrossed with hiking trails and gravel roads that are used for harvesting the trees. The forest is popular for walking, running and mountain biking. The western slopes of the mountain overlook the magnificent scenery of Hout Bay. A tarred private road leads to the summit of Constantiaberg, where an important VHF mast is located . The mast is about 100 m high and is visible for perhaps 80 kilometers in any direction. It was constructed in the 1960s and is used to transmit signals for many local television and radio channels, and also to support cellular networks. The South African Weather Bureau has a radar installation at the summit. The mountain is covered mainly by fynbos, a botanical biome native to the Western Cape. The specific vegetation type of the mountain is Peninsula Sandstone Fynbos, an endangered vegetation type that is endemic to the city of Cape Town - occurring nowhere else in the world. We cover all the suburbs from Wynberg / Kenilworth along Main Road and the railway line through to Muizenberg. From the slopes of the mountain through to the M5 motorway, our team offers an effective and quick service for all your property needs. 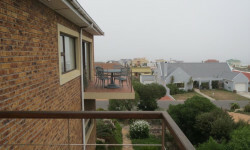 7 Tokai Road, Tokai, Cape Town, Western Cape, 7945.